Autonomist Marxist John Holloway writes in praise of the reaction of the working class in Greece against the imposition of austerity measures. Love and rage, rage and love. Love has been an important theme in the struggles that have redefined the meaning of politics over the last year, a constant theme of the Occupy movements, a profound feeling even at the heart of the violent clashes in many parts of the world. Yet love walks hand in hand with rage, the rage of "how dare they take our lives away from us, how dare they treat us like objects". The rage of a different world forcing its way through the obscenity of the world that surrounds us. Perhaps. A wave of solidarity to crisis victims Greeks is sweeping the world, with a special event planned for Saturday afternoon in a number of cities. More than 10 cities in Europe will see demonstrations under the banner “We Are All Greeks Now”, including Paris and Dublin. “The people of Greece need the international solidarity and they call for our support. Let’s reply to their call. 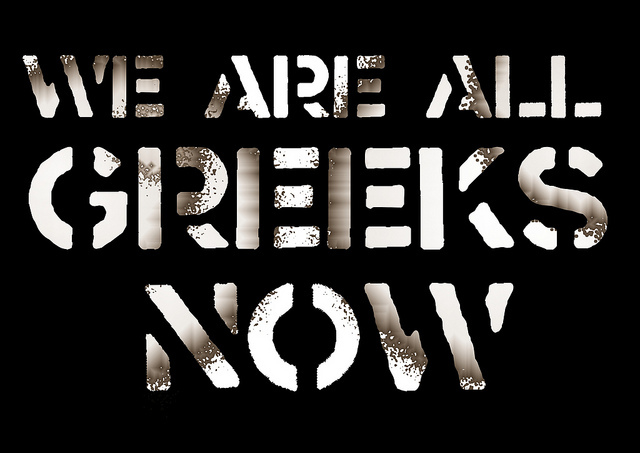 We are all Greeks,” reads the circular distributed across social media for the rallies that are scheduled to take place at 2 p.m.
A rally is also planned in New York, at the same park that the Occupy Wall Street rallies had started this winter. Social media groups in solidarity to the Greek people suffering from the austerity measures and the fiscal crisis have also called for action as they express the fear that what the Greeks are going through is going to apply to other people soon, too. Reciprocal aid means that we are not ‘all Greeks’; we are of no country, of no nationality; we are what our revolutionary solidarity will gradually make us. I'm writting you because I am a member of a group who have a blog which talks about the Greek crisis. We are from Catalonia (Spain) but we post in english too. If you want I'll put here the link and you could coment something if you like it and if like our blog a lot you could subscrive, we'll thank you a lot. Thanks and I hope hearing something from you soon.